Model projections of heavy precipitation and temperature extremes include large uncertainties. However, disagreement between individual simulations primarily arises from internal variability, whereas models agree remarkably well on the forced signal. Post based on Fischer et al., 2014, Geophys. Res. Lett. Changes in precipitation and temperature extremes are very uncertain when examining individual simulations using differences in 20-year means, for example. However, if changes in extremes are calculated by regressing the annual highest daily precipitation or annual maximum daily temperature on global temperature (using the period 1901-2100 in 15 CMIP5 GCMs) to minimise the effects of internal variability, then a more consistent picture emerges (see Figure). Agreement is high on the spatial pattern of the forced heavy precipitation response, showing an intensification over most land regions, in particular Eurasia and North America. Surprisingly, the forced response of heavy precipitation is actually more robust than that of annual mean precipitation. Likewise, models agree on the forced response pattern of hot extremes showing the greatest intensification over mid-latitudinal land regions. Thus, confidence in the forced changes of temperature and precipitation extremes in response to a certain warming is high. Although in reality, internal variability will be superimposed on that pattern, it is the forced response that determines the changes in temperature and precipitation extremes in a risk perspective. Projected patterns of changes in annual maximum 1-day precipitation (top left), annual mean precipitation (top right), annual maximum daily temperature (bottom left) and annual mean temperature (bottom right). 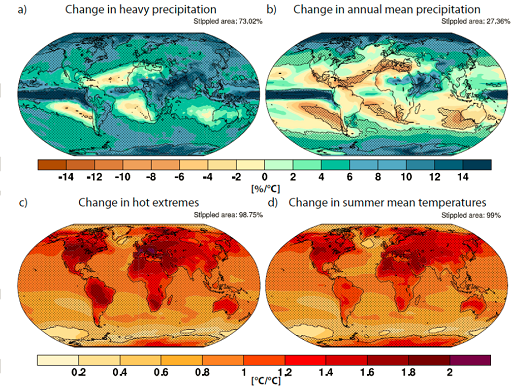 All expressed as changes per degree of global change. Stippled areas are where at least 12 out of 15 models agree on the sign of the change.